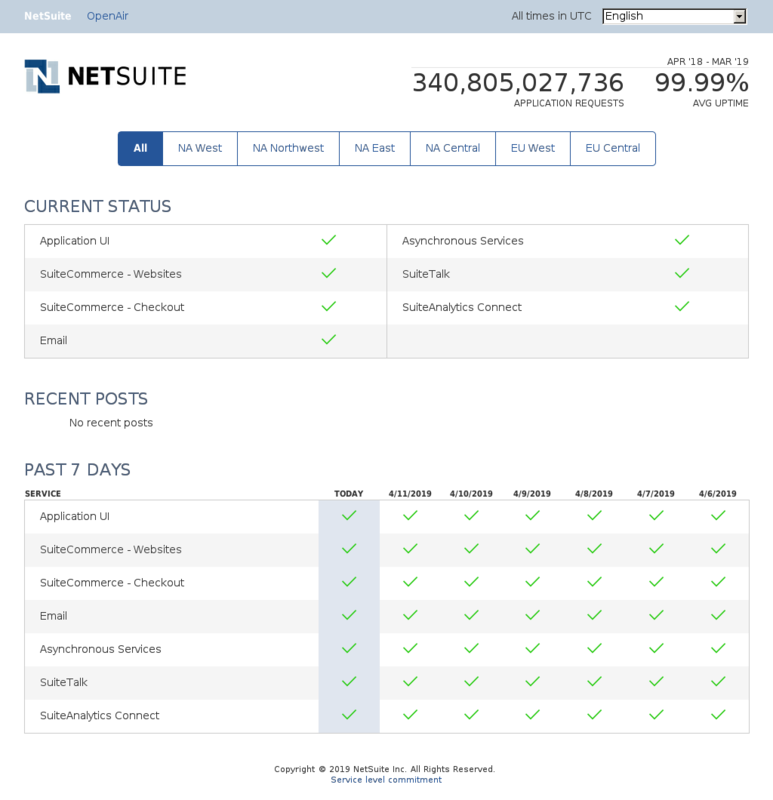 Enter your email to receive FREE instant notifications when NetSuite goes down. 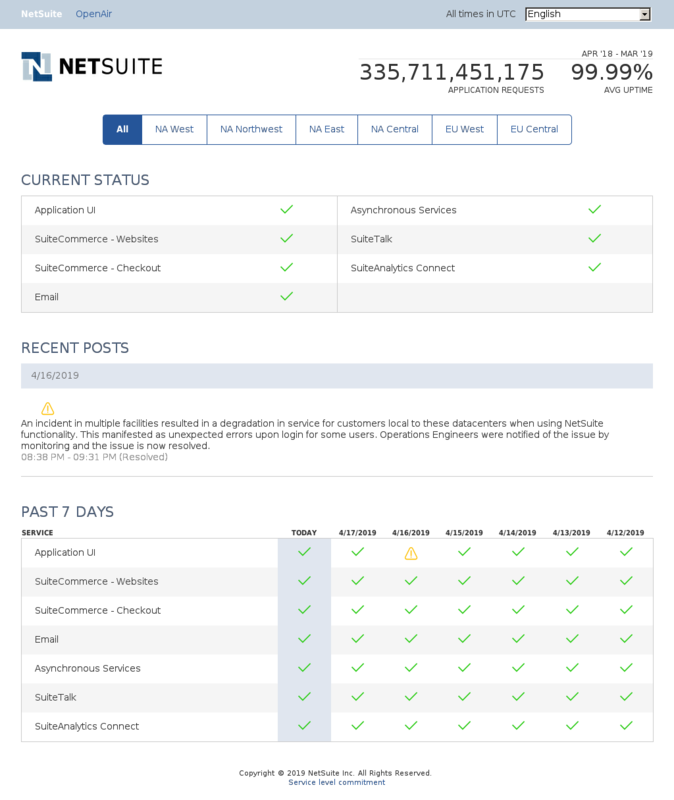 April 20, 2019 08:33 UTC WARN 7 minutes An incident in our database infrastructure has resulted in an interruption of service for some customer accounts. An incident in our database infrastructure has resulted in an interruption of service for some customer accounts. An incident in our database infrastructure has resulted in an interruption of service for some customer accounts. An incident in our database infrastructure has resulted in an interruption of service for some customer accounts. An incident in our database infrastructure has resulted in an interruption of service for some customer accounts. April 18, 2019 00:18 UTC WARN 27 minutes An incident in our database infrastructure has resulted in an interruption of service for some customer accounts. April 16, 2019 21:46 UTC WARN 43 minutes An incident in multiple facilities has resulted in a degradation in application for customers local to these datacenters when using NetSuite functionality. Operations Engineers were notified of the issue by monitoring and are working to resolve it as quickly as possible. 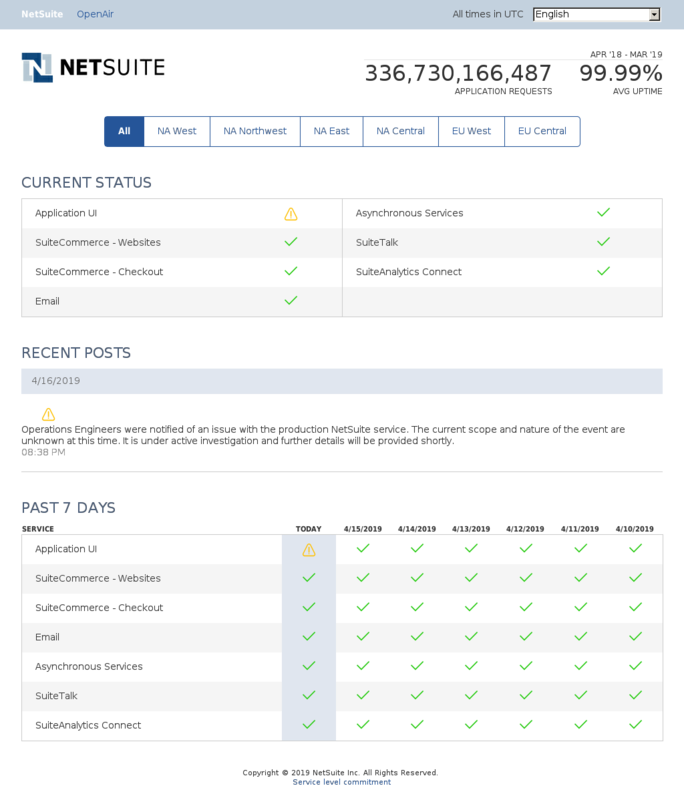 April 16, 2019 20:55 UTC WARN about 1 hour An incident in multiple facilities has resulted in a degradation in service for customers local to these datacenters when using NetSuite functionality. This is manifesting as unexpected errors upon login for some users. Operations Engineers were notified of the issue by monitoring and are continuing to work toward a resolution. April 15, 2019 17:54 UTC WARN 20 minutes An incident in our database infrastructure has resulted in an interruption of service for some customer accounts. April 14, 2019 21:20 UTC WARN 35 minutes An incident in our database infrastructure has resulted in an interruption of service for some customer accounts. An incident in our database infrastructure has resulted in an interruption of service for some customer accounts. An incident in our database infrastructure has resulted in an interruption of service for some customer accounts. An incident in our database infrastructure has resulted in an interruption of service for some customer accounts. An incident in our database infrastructure has resulted in an interruption of service for some customer accounts. An incident in our database infrastructure has resulted in an interruption of service for some customer accounts. An incident in our database infrastructure has resulted in an interruption of service for some customer accounts. An incident in our database infrastructure has resulted in an interruption of service for some customer accounts. April 13, 2019 04:04 UTC WARN about 2 hours An incident in our database infrastructure has resulted in an interruption of service for some customer accounts. 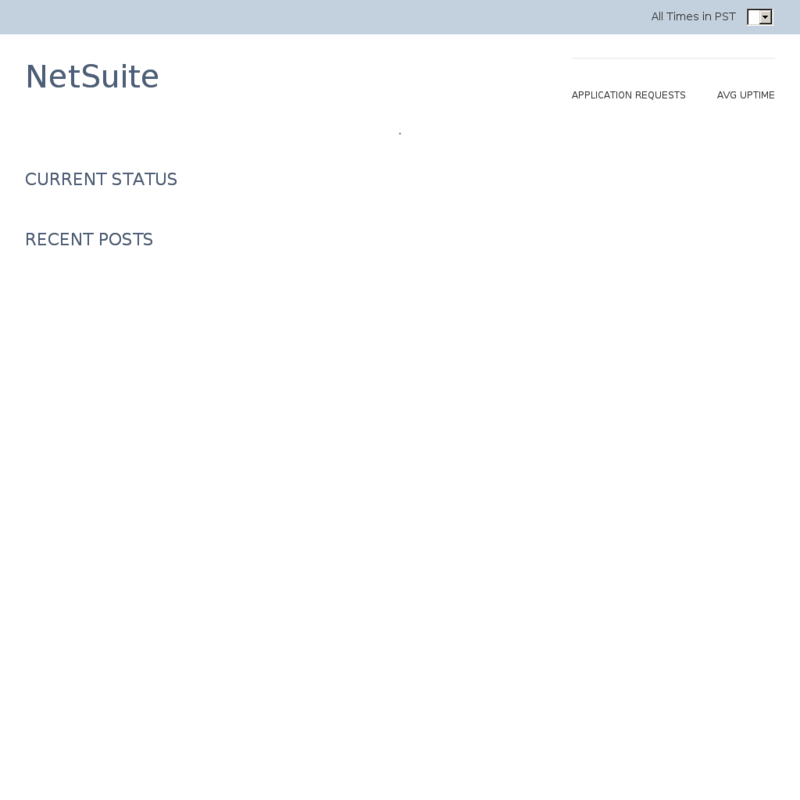 April 12, 2019 10:32 UTC WARN 20 minutes An incident in our database infrastructure has resulted in an interruption of service for some customer accounts. March 29, 2019 21:56 UTC WARN 2 days An incident in our database infrastructure has resulted in an interruption of service for some customer accounts. An incident in our database infrastructure has resulted in an interruption of service for some customer accounts. An incident in our database infrastructure has resulted in an interruption of service for some customer accounts. An incident in our database infrastructure has resulted in an interruption of service for some customer accounts. An incident in our database infrastructure has resulted in an interruption of service for some customer accounts. An incident in our database infrastructure has resulted in an interruption of service for some customer accounts. An incident in our database infrastructure has resulted in an interruption of service for some customer accounts. March 27, 2019 13:35 UTC WARN about 2 hours An incident in our database infrastructure has resulted in an interruption of service for some customer accounts.